It's Valerie again. I have another Christmas DIY home decor project to share with you. This time I have a wall hanging I made for My Mind's Eye with their new Christmas collections. I picked a stick from the yard and draped handmade pom poms and strung gold die cut letters from the Christmas on Market Street collection. I used this pin to help me make a cut file which I then used to create the snowflakes from patterned paper from the Cozy Christmas collection. I added a string and hung each one from the branch as well. I think this combination of pom poms, gold letters, and snowflakes would look great hanging from a mantel as well. To view my post over at My Mind's Eye click here. Merry Christmas everyone! 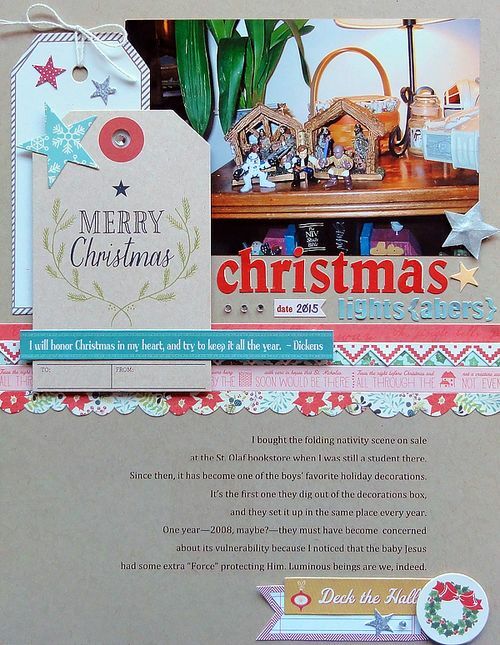 Aliza and I welcome you to a week of holiday decorating using your scrapbooking supplies. In my household we're getting ready for a trip so the holiday decorations have not come out of the closet yet. Although, my son is definitely ready for them! My project for you today is about as easy as they get. I have created what may be the world's easiest handmade advent calendar. Supplies needed are: patterned paper scraps, Jenni Bowlin Studio Hotel Key Holder, and a 1 1/2" paper punch or die cutting machine. And I completely apologize for using a discontinued product today. You may be able to find one on ebay or a real vintage one. You could also DIY one with a thin piece of plywood and nails. So this is the first and only Christmas decoration we have on display right now, but it's probably the most necessary one. Now I shouldn't get asked multiple times a day how many days are left until Christmas. Which really is precisely the reason I sort of love January. It’s cold and dreary and smoggy, and no one expects you to get anything really productive done. What’s not to love about a month of staying home and getting other stuff done? 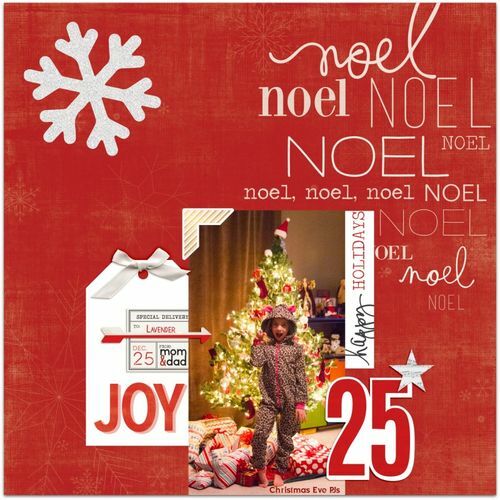 It’s really just a standard Christmas layout: some red and green, some glittery embellishments (although, I confess, I love silvery glittery embellishments quite a bit). What I love about it—what I want to share—is the idea I had for the journaling. So here’s a little journaling challenge for you. When you are writing your stories, sometimes try to think backwards—remember something from your childhood, or from when your child was younger, and connect it to the event (it doesn’t have to be a holiday) you’re writing about. Writing like this creates interesting, layered stories. It’s also an approach you can take when you’re stumped on what else you might write about. We are back this week with a new sketch from our original gallery, Why We Scrapbook. This week we are starting with a layout from Katrina Simeck, A to Z. Here is the sketch. Did you notice there is room for 9 photos? Nine! This week we again have two layouts using the sketch. The first doesn't stray too far from the sketch, with the exception of the missing journaling. 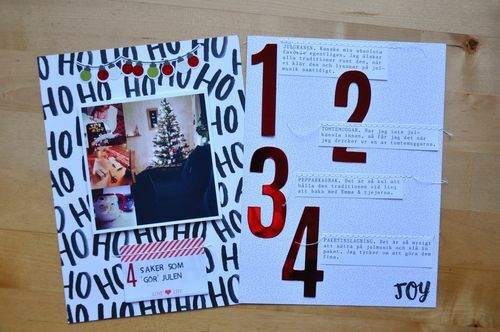 The second tips it on its side, moves the title and journaling, then centers the elements. 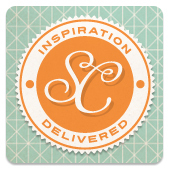 We hope you enjoy the sketch and find inspiration for using it from the layouts! Hello, and Merry Christmas! 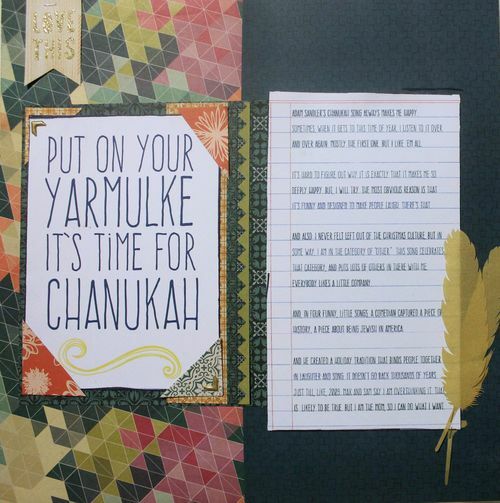 It's Jennifer Larson, sharing an idea for scrapbooking the holidays: letting go of traditions. I picked nontraditional colors for the layout, which seemed appropriate for a page about saying farewell to a tradition. I also kept the page free of most themed products--again, reflecting my story about stripping away the trimmings to find the most important tradition. If you haven't scrapped your traditions, do so! Or scrap about traditions that are no longer a part of your holidays. Reminisce on the place they once had in your life and what you do now. I wish everyone the best as the year winds down and the new year lies in wait for us all! An 80% chance of snow on Christmas day here. Especially since it's been astoundingly dry, that feels like a Christmas miracle! I'm excited for the snow and for the magic of snow on Christmas day, and it makes my anticipation even bigger. But I'm also excited for another, scrapbookery reason. I decided, right then at my computer, that I’d inadvertently started a new Christmas tradition: every year, I plan on taking a photo of my porch on Christmas day. I’ll pay more attention to composition this year, and turn on the house Christmas lights. I’m not sure what I’ll do with them—a mini album a few years into the future? Maybe just a scrapbook page about my front porch (a topic I’ve never scrapped before! ), my affection for it and the memories it holds. Maybe an observation in some form I can’t imagine yet, about how things have changed and how they’ve stayed the same. I’m not sure. I do know I like the idea of this new tradition. It makes me even more excited for Christmas, because this year I'll get to photograph it with snow falling. So tell me: do you have any annual holiday photo traditions? Hello, and welcome to today’s Write post. If you’re anything like me (Amy Sorensen), you’re feeling a little bit frantically busy, preparing for Christmas. I have a billion things to do today, but I wanted to share a quick journaling tip first, before I shop, bake, make candy, pick my daughter up from the airport, and go to a family party. When you find yourself lost for words, or unsure about the story you want to tell, try using the words from an embellishment, card, or patterned paper as a starting point. It’s from Christmas Eve 2004 (I’ve been trying to scrap all of my 2004 images this month), and I love it so much. Quite a bit has changed in our world since then, but when I look at the photo what I remember most is how it felt to have a whole passel of Santa-Claus believers. But I didn’t quite know how to frame my words—how to start saying what I wanted to say. So I flipped through some supplies, and a Maggie Holmes sticker caught my eye. It so closely matched what I was trying to say but couldn’t quite, yet, that I pulled it out of my pile, thought for a few minutes, and then I wrote my journaling. The words flew out of my fingers once I had that spark! Here is the layout I made. The sticker that inspired me is the one that says "my heart is full," and it was inspiring because a full heart is exactly what this photo made me feel. So! 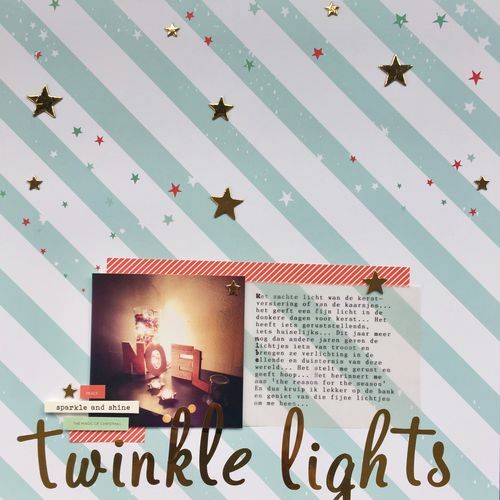 If you happen to find yourself with a little bit of scrapping time in between last-minute shopping and all that wrapping, turn to your embellishments for a journaling idea. See where it takes you! Today's printable present is the gift of celebration! With only five days until the big day, it is just around the corner! If you would like, you may download it here. Thank you for stopping by during this busy holiday season! Hi there! It's Cristina here, and today I want to give you an update on how my December Daily album is progressing. Last month I talked a bit about what my plans were for this year, and it's time to check in and see how I am doing. My plan for this year included: handmade album, with pages of different sizes; one story per day. As fate has it, this December has turned out to be by far the busiest I have ever had. I thought it would be hard to top last year's craziness, but it has indeed happened. In the past two out of three days I have been at the office from 8 AM to 10:30 PM. And I see no end in sight, yet Christmas is less than a week away. Ugh! So while I am not up to date with my December Daily album, given that I have very little time to work on it, I have made a little progress and I have been taking photos regularly and keeping track of what story I want to tell each day. I hope to get a good chunk of it done just before Christmas, because I know my inspiration dips significantly once Christmas Day has passed. I haven't bought any new Christmas supplies this year, but I have a sizeable stash to draw from and it is fun to finally use all these pretty bits that I had been hoarding. Now it's time to show you some pictures of my album so far. I haven't worked on the cover yet - I will do it at the end since I need to see what size my album will have. But I plan to include this pretty gold star vellum paper at the front. of the album. And here's what all my pages stacked together look so far. I have days 1-7 done at this point. I love having pages peeking out. I think it adds a lot of interest to the album! For December 1st, my story was about the tea advent calendar we got this year. For this page, I included a 3x4 pocket as a page to hold some journaling. I like to include stamping in my album because I love stamps so much! And now.. I'd love to hear from you! 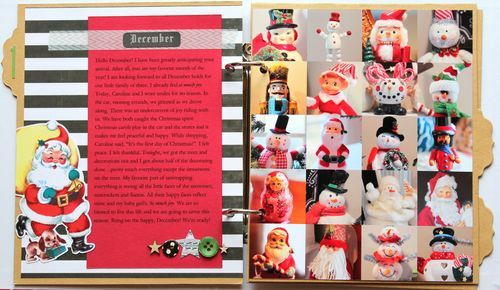 Have you been documenting your December? Leave me a comment and let me know!